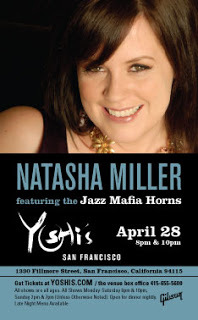 Entire Productions Joins Facebook (and other recent developments)— Entire Productions, Inc.
Also, our founder (Poignant Records recording artist) Natasha Miller will be appearing at Yoshi's in San Francisco on Tue/April 28th. She will unveil her 6th CD featuring Adam Theis and the Jazz Mafia Horns. The CD is called SpinVintage and offers funky twists on standard songs like "Summertime", "What's New" and "Blue Skies". Many artists have done their rendition of these standards, but not like Adam and Natasha! Come for sonic surprises and a hip/edgy approach to these vintage gems! Natasha is most known for her work with the songwriter Bobby Sharp who wrote "Unchain My Heart". She will be performing some of his repertoire as well. Breathe New Life Into Your Events this Season!